Our standee kits have become a holiday favorite with our customers. So much so that we couldn't resist adding more to the line this year. 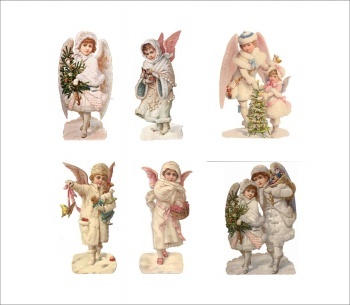 This kit contains 6 of the very prettiest of the Victorian Snow Angels. They are printed on high quality archival paper and laser cut. In addition, each piece has it's own sturdy backer board, also laser cut and a small wooden stand. All you need to do is add a bit of glitter if desired, glue the artwork to the board, and attach the stand. I love these girls so much! They are among my favorite Christmas images. I have done this set in two sizes.